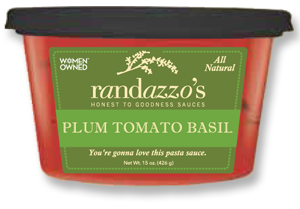 Randazzo’s Honest to Goodness Plum Tomato Basil Pasta Sauce not only captures the “just picked” taste of fresh plum tomatoes and basil, but cultivates the natural sweetness of everyday garden vegetables when they are cooked just right. Plum tomato basil sauce can be the “go to” sauce for any pasta dinner. It can also be served cold atop Italian bread as a bruschetta, or for an easy pizza heated over a favorite Italian bread with cheese. Use your heated Plum Tomato Basil as a bread-dipping appetizer with a little bit of thinly shaved parmesan cheese. If you want to keep it light in calories but rich in vitamins and protein, add one can of white beans (drained and rinsed) and chopped, fresh kale or escarole to the whole container of plum tomato basil sauce and you have a hearty, satisfying summer stew. This is also a great sauce to use for bruschetta or on heavier pastas like gnocchi or tortellini.